Should You Subscribe to the Nest Aware Service? Home » Posts » How To's » Should You Subscribe to the Nest Aware Service? Nest Aware is the paid cloud service that is offered for use with any Nest Cam home security camera. For those that have already purchased their camera, this is the question that you will need to answer after your free 30-day trial is over. All purchasers of a new Nest Cam get a free trial. So you are now asking the question of should I subscribe to the Nest Aware Cloud Service? We’re going to cover what you get with the Nest Aware service, the cost and evaluate the overall value as well as alternatives. With a few minor exceptions, Nest Aware functions the same on all of the current Nest Camera products. We have extensive reviews of these cameras. Be sure to check out our reviews of the Nest Cam, Nest Cam IQ and Nest Cam Outdoor for more information. The photo that accompanies this article is what you will receive after the trial is over. I have several Nest Cams and DropCams. You are looking at a few that do not have the service. The pricing goes by the amount of history that is kept. 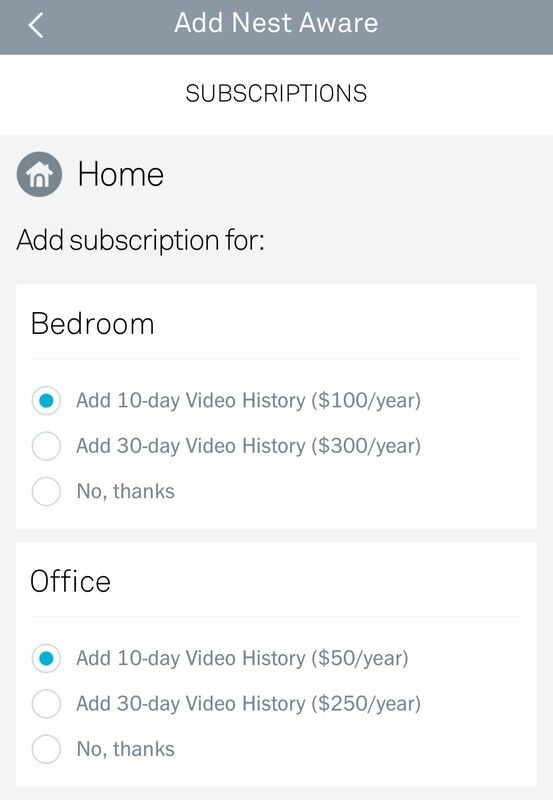 Effective early 2018, Nest rolled out a lower priced plan that provides 5 days worth of video for $50. Ten days worth still costs $100 annually. Thirty days will cost $300 per year. Additional cameras net a discount of up to 50% off these prices. The Nest Aware subscription provides more than just cloud storage. Obviously, you receive the ability to go back in time and review what was going on during a certain time frame. Mighty handy for times when you receive a motion alarm and want to check into what happened. You also have the ability to create a Timelapse which is Nest’s feature for summarizing the day’s events into a video clip. This is similar to a something seen in the Logi Circle Security Camera with their Day Brief feature (which is provided for free). Consider it a movie trailer for the entire day’s worth of video. With a Nest Aware subscription, you now receive features that will minimize, and potentially eliminate, false motion alerts. The subscription will provide some additional algorithms to filter out false alerts. It also provides activity zones. Activity zones are the most effective way to eliminate false alerts. An example of effective use of activity zones is when you have a camera that’s pointed outdoors through a window. Without activity zones, you will receive a motion alarm every time the wind blows and a tree branch moves. Using activity zones, you can establish an area where there are no leaves or tree branches and only monitor motion within that zone. I have used this feature very effectively with my Samsung SmartCam where they call this feature motion zones (which is provided for free). So we come back to the question of should I subscribe to Nest Aware? No question, the service provides valuable usability to your Nest Cam or DropCam Pro. You get to go back and see what happened earlier in the day. You also add more functionality to your Nest Cam or DropCam Pro by adding activity zones and time-lapse. These feature will come at a cost that can exceed what you paid for the Nest Cam. The 30-day retention will cost $300 per year. This is a subject that a lot of people aren’t aware of. Streaming 24×7 video eats a lot bandwidth. Your current internet provider may cap your internet usage and force you to upgrade if exceeding their caps. Depending upon the connection into your home or office, you may need to upgrade the speed of your connection. If using your Nest Cam in 1080p HD mode, depending upon the amount of activity, it can require up to 1.2 Mbps with a monthly maximum potential of 380 GB. You can reduce the consumption by using a lower resolution. For example,using 720p will reduce these numbers by more than 50%. You probably noticed that I compared the service to a few other cameras and many of the features that Nest Aware charges for are available for free with other cameras. If you haven’t purchased your camera yet, then there are alternatives. If you already purchased the camera, then the subscription to Nest Aware is the only option. A Nest Cam does not have on-board storage like an SD card so the only way to see history is to pay the fee. To be honest, I love Nest hardware, but really dislike the fact that I have to pay for additional functionality. In my opinion, features such as motion zones should be included at no additional charge and an SD card should be an available option. I have found Nest cameras to be among the most reliable for real-time viewing. However, without a paid subscription plan, the abilities included with the Nest cameras are badly lacking versus most of their competition. If you haven’t yet purchased the Nest Cam, a Arlo Pro provides 7 days worth of free cloud storage and includes most of the features that a Nest Cam has. Take a close look at that one. A Yi Home Camera provides SD storage locally (plus cloud abilities) and includes many of the false alert elimination features already discussed. So Should I Subscribe or Not? The Nest Cam is an excellent piece of hardware with some great software. If you love your camera, and have purchased it as a security camera, the added Nest Aware subscription is probably a necessity. Opt for the 5 day plan and see if that’s sufficient. If you purchased a Nest Cam to just peer into the scene and do not use it as a security camera, then you probably do not need it. Should I Subscribe to Samsung SmartCloud? Should I Subscribe to Petcube Care Cloud Services? Should I Buy a Refurbished Home Security Camera?